Teluk Stabas Festival is commonly called Pesta Sekura (Sekura Party) or Pesta Topeng (Mask Party) by Lampung people. The festival is intentionally celebrated as an effort to reveal, to preserve, and to develop the heritage of Lampung people`s cultural civilization. It originally comes from Lampung society, especially West Lampung society that is visited by either local or foreign tourists. Moreover, the local government officials also include into the participants of the festival. Sekura Dance is celebrated to express the happiness of Muslim people after a month of fasting. The celebration is held a day after Eid El-Fitr dated on Syawal 1st to 5th by turn from one village to another. Sekura means a mask intended to uniform the facial expression of people celebrating the happiness in a same way. The multifarious masks used during the celebration are the magnetic attraction for people coming to the Merdeka square in Liwa Limbar City. There are two types of sekura dances, sekura betik and sekura kamak (dirty). It is called betik as the masks are beautifully decorated with long cloth. Otherwise, kamak is type of masks that are made of wood that look dirty with plant tassels as the decoration. During the celebration, you may join the dance amongst the real dancers when you have put on the masks over your face. At the end of the celebration, panjat pinang (areca climbing) competition is conducted where many presents are put above the areca. 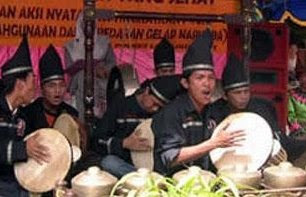 That is one of the cultural heritages of Lampung people with various cultural backgrounds. Sekura Festival is held at public space area in Merdeka Square, Liwa-limbar City, West Lampung District, Lampung Province, Indonesia.